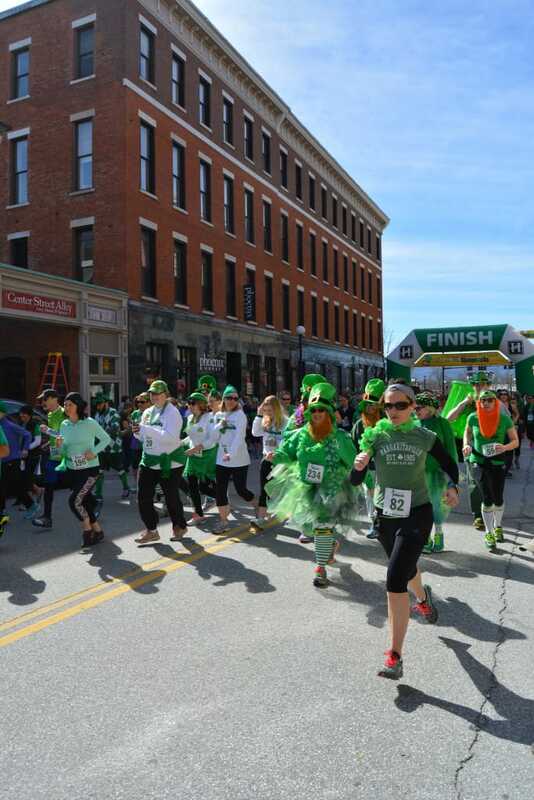 Saturday, March 11, 12 p.m.—RUTLAND—Join Heritage Family Credit Union for the fourth annual Shiver Me Shamrocks 5K Fun Run/Walk and Leprechaun Leap Fun Run for kids on March 11, to benefit the Wonderfeet Kids Museum in Rutland. The first 200 runners to sign up get a free long sleeve t-shirt. After the race, join fellow runners and walkers to share in a little St. Paddy’s celebration at Hop’n Moose on Center Street in Rutland for an after party with music, drink and food specials and lots of fun. Race prizes for first place for men and women as well as men’s and women’s best costume will be awarded at the after party. Sign up is a $30 donation. The Leprechaun Leap Fun Run for kids is free. Race day registration opens at noon at Heritage Family Credit Union’s parking lot on 50 West Street, Rutland, and the race begins downtown on Center Street at 1 p.m. Participants don a lot of green during a previous Shiver Me Shamrocks fun run.